My table is in the upper left hand corner of the screen – not the one in the very very corner (boy she arrived early! ), but directly beside her. I noticed my big white display cabinet right away. Sometimes I feel like a broken record talking about how tired I am & how much work I still have to do. I *love* the work that I do, so it’s a good kind of tired! I definitely don’t want to sound like I’m complaining & wouldn’t change a thing (well, except start prepping for Christmas in June! ), but it’s kind of nice to have video proof that yes, I am allowed to be exhausted after a day like that! We’re doing it all again this Sunday, December 5th! 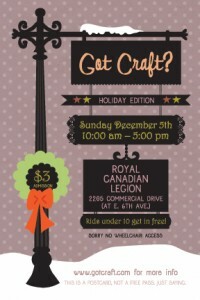 You can come see what the craziness is all about from 10 a.m. to 5 p.m. at the Legion on Commercial Drive (Vancouver, BC). If you feel like avoiding the craziness, I would highly recommend coming later in the day. The first 45 people through the door get free swag bags, so the line ups start early! Next postLast Market of the Year!